I was preparing Annabelle’s medications a few nights ago, and the enormity of “everything” hit me. While every time a baby is born, the parent’s lives are changed forever, but Annabelle was ten times so for us. With my other kids, I hardly even used a baby monitor. They were healthy, I always heard them, and I trusted they would be okay. They also ALWAYS slept in their own room. With Annabelle, I about had heart failure myself when we switched her to her own room last month. That was a BIG step for us. I still go in there when she’s asleep during her nap-time and watch her, holding my breath until I see her little chest rise and fall, reassuring me that she’s still alive. With my other kids, I have a hard time remembering the full 10-day course of antibiotics for an ear infection. With Annabelle, I have heart palpitations if her meds are a half-hour past her allowable timeframe. With Annabelle, Clorox wipes are my best friend. With my other kids, I’d look back at Christmas time and thank God for the past year He allowed us to spend with our kids. With Annabelle, I thank God every day for the gift of even just one more morning waking up to her smiling face. I’m still getting used to the whole idea that life will never be the same with Annabelle. I think I keep waiting for it to “get back to normal” but at some point, I feel like I need to accept the fact that it won’t ever be. I talked about having a new normal a lot when Annabelle first came home, but in the back of my head, I think the thought still lingered that it was a temporary new normal. That things would slowly slide back into a rhythm. I’m not doubting it ever will. Annabelle will be on quite a few medications the rest of her life. She’ll always be at risk of rejection. She’ll have to eat super well to take care of her precious heart. She’ll have annual heart caths and heart biopsies the rest of her life. She’s at a much higher risk for cancer and other diseases due to the medication she’s on. There’s a pretty decent chance that she’ll have to have another transplant someday. And she won’t be allowed (or will be highly counseled against) having babies when she gets married. And she’ll be living with a big question mark as to what her life expectancy will be. As much as this is all pretty daunting to me as her mother, it more breaks my heart for HER. Her normal will be much different than what I would have hoped for her. But my prayer is that I can teach her how to accept what God has given us and how to move on, how to rise above the yucky stuff and use her weaknesses to showcase what a mighty God we serve. And my prayer is that she will grow to love Jesus with all of her heart, and to serve him with every single day she is blessed with. This is my prayer for ALL of my girls. Inspector Annabelle. 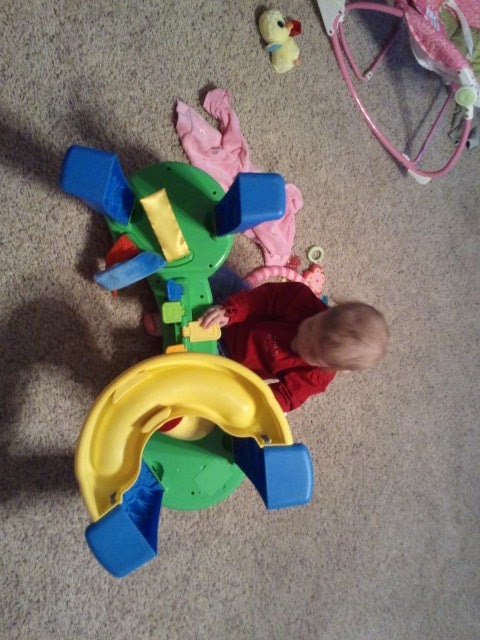 I heard this crash, then ran in to see that she’d purposely pulled the thing over and was playing on the underside of it! The stinker! On her knees!!! This is a big step for Annabelle… before she’d scream bloody-murder after only a second. She stayed there about 5 minutes playing! 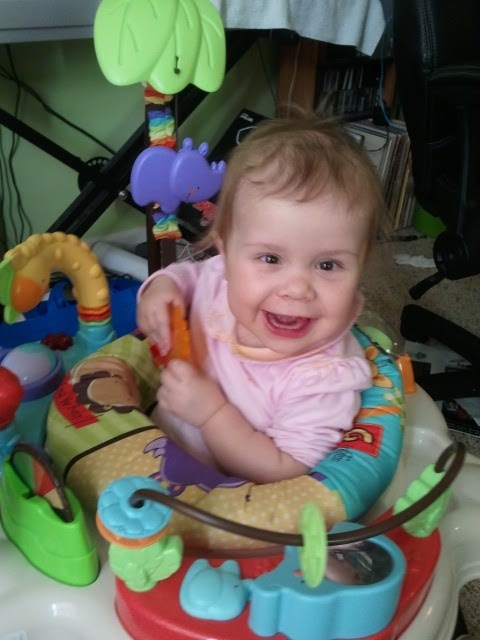 To make room for Christmas and help with editing, Mommy moved Annabelle’s jumperoo into my office. 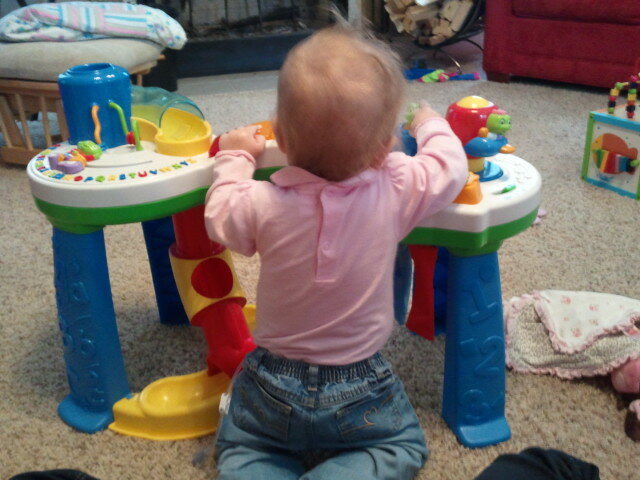 She likes playing while Mommy writes! BIG PT STEP!!! 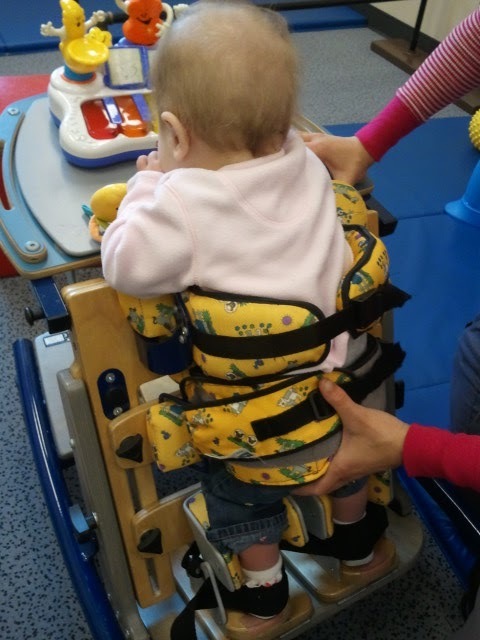 We tried the “stander” on Thursday!!!! We assumed she’d scream right away, but she stayed there for 10 minutes! Granted, she wasn’t in full standing (aka she was leaning forward some) but we’ll make baby steps toward the full standing position. And fun times in OT too… swingin’ like a big girl! She liked it! On Friday, we ventured out to Logan’s before picking up our Christmas tree. 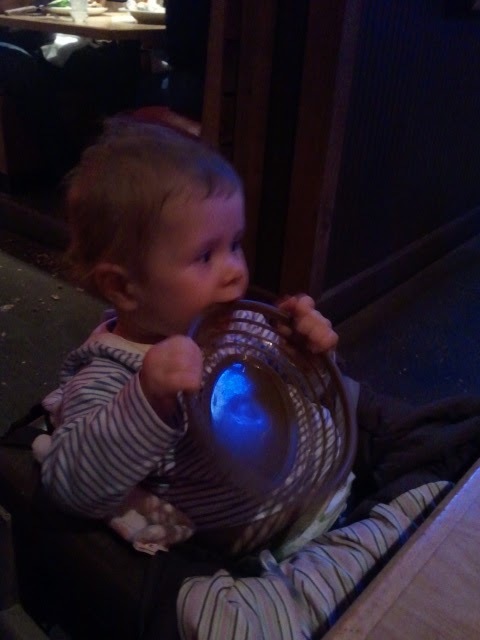 Annabelle refused to eat, however she DID like to chew on the roll bowl, GO FIGURE! Here it is… still netted! 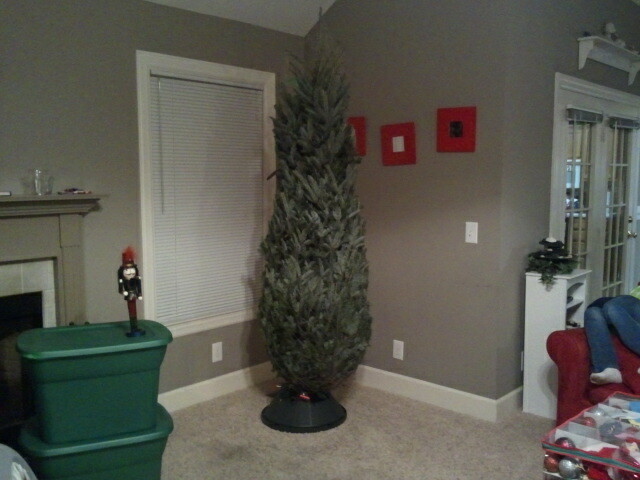 Come back on Wednesday for a peak at the Phillips’ family Christmas house! 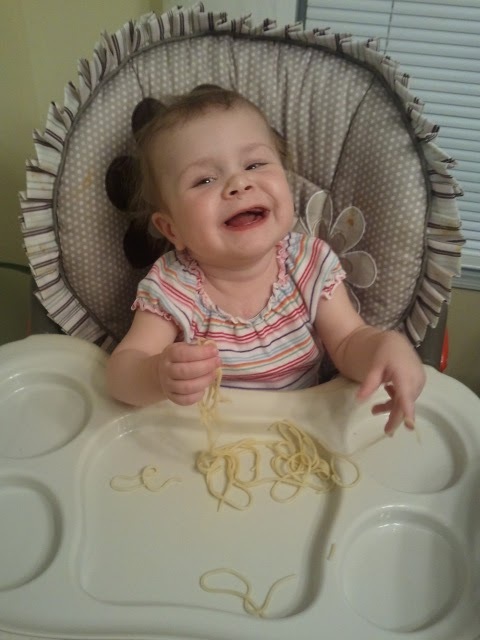 Spaghetti is FUN!!!!!!!! She even put some in her mouth! Didn’t eat it, but didn’t gag at it either. A victory, so WOOHOO! A minor blog change. I’d changed my kristaphillips.com web address to this blog (since I didn’t have time/energy to maintain my own website for my writing just yet) but in that change, when you went to Kristaphillips.com while you could read my blog, you couldn’t comment. Adorable pictures! She's a sweetheart. I just have to say, Krista, that despite the challenges Annabelle will have throughout her life, I see so much love and Godly wisdom coming through from you and your family that she will also be completely blessed and able to get through these times with grace, and I think that's a beautiful gift you and God have given her. I've so loved reading about your journey this past year, Krista. You are an honest, lovely role model. God bless your family this holiday season. I cried out of gratitude for you when I read this post. As a note of encouragement, look up Louie Giglio-laminin on you tube. It is an awesome reminder for all of us of who holds the world in His hands! Blessings. I love those pictures, Krista. And I love that in the midst of all of this, you have been SUCH a bright light for Jesus. Love the pictures, Krista! Glad you posted them. I love love love Monday,Wednesday and Fridays! Your updates make me smile, laugh and cry. You are an inspiration to me and I am so thankful for your blog. Just returned from Daniel's annual visit to the cardiologist, complete with an EKG and Echocardiogram. After reading your blog, it reminded me of when Daniel was a baby … I'd check on him before going to bed, then not even be in bed 5 minutes before I'd be back in his room checking on him. I'd finally go back to bed then get nervous and go check on him again after only a few minutes. This ritual went on for hours sometimes. (Finally, God had to remind me to stop being anxious and to leave it in His hands. See Philippians 4:4-9. I guess I'm trying to say you're not alone in how you feel or are dealing with your child but God will help … as I'm sure you already know. I also remember wondering if life with Daniel would ever be "normal"? Though it isn't the same as it is for my oldest son, we've adjusted to our "new normal" and like you, I realize every day how blest I am to have him with me. We -(my boys and I)- continually pray for you and your family. God will get you through, just as He has done so far.